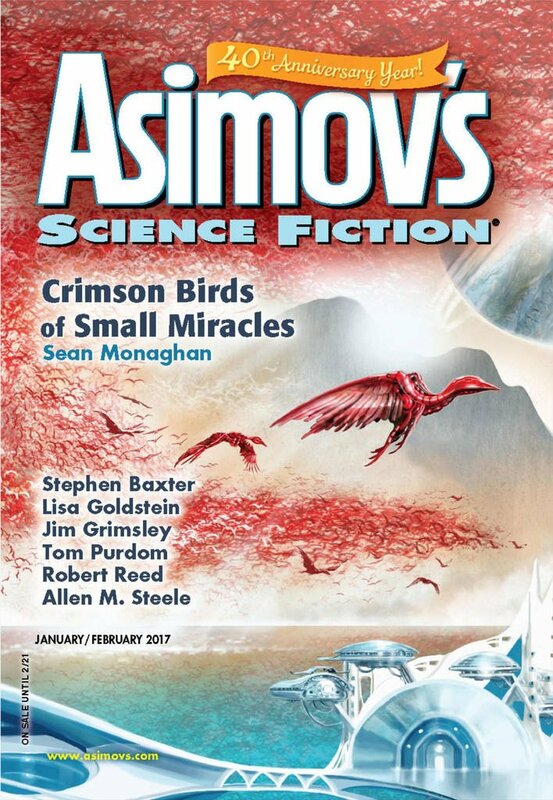 "Starphone," by Stephen Baxter [bio] (edited by Sheila Williams), appeared in Asimov's Science Fiction issue 01-02|17, published on December 15, 2016 by Penny Publications. All infodumps, no story. Very dull. That's a little harsh, as there is a bit of story at the end, but it's 90% exposition, albeit handled quite well. From the intro I assume it's setting up other stories to come. Also, the notion that 100 cell phones can form an antenna capable of picking up signals from deep space is ludicrous. Slightly off topic, but the RSR mini-review link for Robert Chase's 'Pieces of Ourselves' from the same issue of Asimov's goes to a 'page doesn't exist' error. Thanks for the bug report. I've fixed the review link to "Pieces of Ourselves" in the January 2017 Monthly Ratings.